Backers of a proposed initiative that could dramatically increase taxes on commercial and industrial properties by undoing some protections imposed by 1978’s Proposition 13 submitted thousands of petition signatures Tuesday in hopes of getting the issue before voters in 2020. 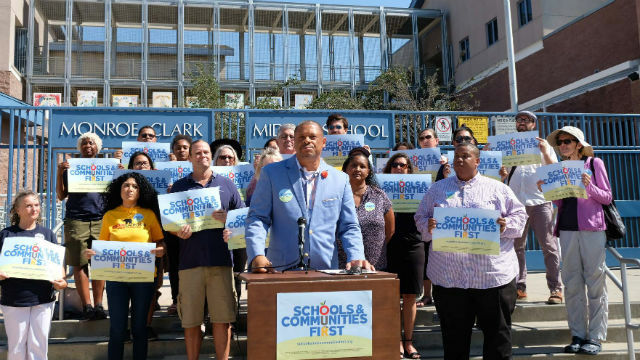 Members of Schools and Communities First, the statewide coalition backing the initiative, held news conferences in San Diego and other locations around California to announce the submission of about 850,000 petition signatures to county registrars. The group needs 585,407 valid signatures to get the proposal on the statewide November 2020 ballot. The group had initially been trying to get the measure on this November’s ballot but opted to delay two years. The initiative would create what is known as a “split roll” system by revamping Prop 13, which imposed limits on annual property tax increases regardless of changes in market value. The initiative would require instead that commercial properties be assessed at current market value but would maintain the caps for residential property. Updated at 6:10 p.m. Aug. 14, 2018.